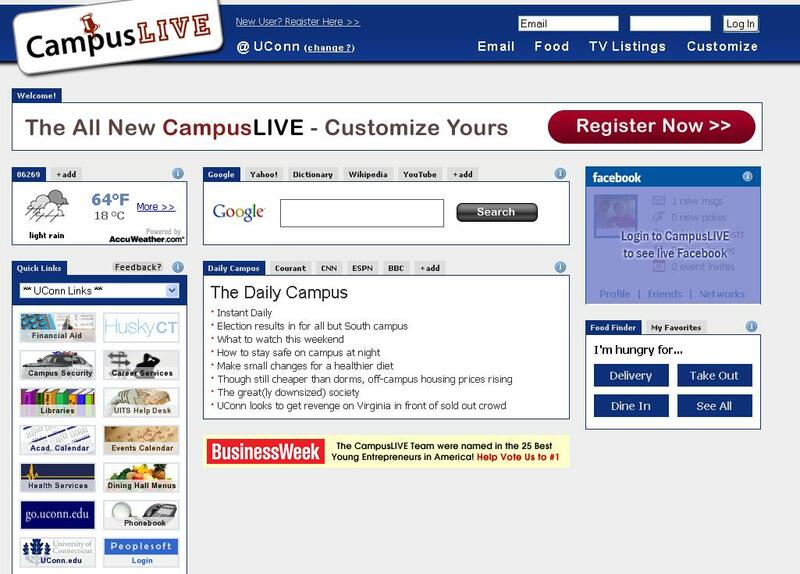 Will college students use a Web site devoted to helping them find campus services and local businesses? CampusLIVE cofounder Jared Stenquist thinks so. About a year and a half ago, the self-taught Web developer started the site as a hobby in his University of Massachusetts Amherst dorm room. When advertisers started to contact him, he took a leave of absence to develop the business. The site can now be customized for 18 campuses around the country, including the University of Vermont, University of Connecticut, and George Mason University. Stenquist, who isn’t planning on going back to school, says the business, which employs five full-timers as well as interns, had just over $100,000 in revenues in 2007 and is negotiating a $1.25 million seed round with a group of angel investors. He expects it to be profitable by January. Besides the fact that their site looks exactly like TheCampusAtlas, and besides the fact that they started after TheCampusAtlas did, the fact that BusinessWeek considers the idea worthy, is validation. Validation that our insight into a market need actually existed, and validation that the need could be executed in a successful manner. While I congratulate the Campus Live team, I also congratulate the other founders of The Campus Atlas. Stay tuned for the future of The Campus Atlas.